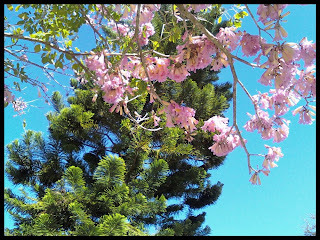 I love both the pink and yellow tabebuia trees. I've seen both blooming in my neck of the woods, but my yellow one is a late bloomer. Very pretty! This pink tabebuia is so pretty! I love soft pink color, just like this one! Look so much like cherry blossoms. I love the pink tab! Need to find a place for one. A few years ago, I headed to a mom-and-pop nursery in the area that sells these. They had rows and rows and rows of tabs in bloom. I had gone with the intention of buying a yellow tab, inspired by the trees blooming all over town. When I got to the nursery, I was sorely tempted by the gorgeous pink ones. In the end, I stuck to the original plan and bought a yellow. I need a bigger garden! My yellow is coming back to life with lots of buds poking out! I'm so excited that the one tropical tree I planted did well in the crappiest winter ever. I also found some tillandsia seedlings sprouted on the trunk when I looked up close, probably ball moss, but cool nonetheless. I'm eventually using the tab as a host plant for broms. This pic was at winter park by the way... as we ate pastries the flowers fell gently into our laps. I thought they looked like cherry blossoms too, and the framework of the pink tab is very architectural. Good shot :-D for me, pink blooms are always pretty. I really like the pink tab...used to the yellow, which I also appreciate but the pink resembles my parent's cherry blossoms. Love it!